The highways in the Dallas-Fort Worth area are overburdened. Roads can barely hold the traffic that flows over them on a daily basis. Because of this, many people choose to commute to school or work on the bus to avoid such traffic. When driver negligence on the part of bus drivers is added to this hectic equation, however, it’s a recipe for serious accidents. If you have been hurt in a bus accident, Steele Law, P.C., is here for you. At any time, you can contact our vehicle accident attorneys at (214) 333-9393 to schedule a free initial consultation with a trusted Lewisville auto accident lawyer. While we usually think of "accidents" as involving two or more cars, bus accidents are more common than you may think. According to the U.S. Department of Transportation, there were a reported 283 people killed and 24,000 people injured in bus accidents in 2011. In fact, many aspects of bus riding are more dangerous than riding in a car. Buses have a high center of gravity, making them more likely to tip over. This fact, combined with riders who are standing up and not wearing a seat belt, can result in serious injuries if a collision does occur. What Could Cause a Bus Accident? When you take the bus, you rely solely on the bus driver to get you to your destination safely. While these drivers must go through training, sometimes that training is insufficient or rushed. Even when they are well-trained, drivers have to remain vigilant at all times, as a bus has larger blind spots than a car. Any distraction could cause a driver to miss something important and crash. Sometimes, an accident is caused by the bus itself, rather than the driver. A mechanical or equipment failure due to improper or infrequent maintenance could result in a driver losing control of the bus. These causes involve questionable behavior demonstrated by one or more parties - maybe the driver, the bus company, or perhaps a third-party maintenance company. When a bus accident occurs, any of these groups could be at fault, legally. While the period of time immediately after a bus accident is, understandably, overwhelming, there are actions you should take to help protect your rights. As with any serious auto accident, you should file a police report and take photos on the scene of damage. You should also make sure to see a doctor to examine any injuries you have. Whether you have been in an accident with a Lewisville city or school bus, and whether your injuries are minor or life-threatening, Steele Law, P.C., can help. As your bus accident law firm, we will work hard to sort through the facts of the case, establish negligence and liability, and get compensation for your medical bills, pain and suffering, lost wages, and other costs. 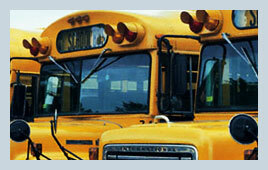 For a free consultation with a dedicated Texas bus accident attorney, contact us online or call (214) 333-9393 today. We are available for people in Dallas, Fort Worth, and the surrounding areas of Texas, including Lewisville, Grapevine, Carrollton, and Plano. Lewisville Bus Accident Lawyer Disclaimer: The information presented on this site should not be construed to be formal legal advice nor the formation of a lawyer or attorney client relationship. Any results portrayed here were dependent on the facts of a particular legal matter and results vary from case to case. Please contact an attorney at Steele Law, P.C. for a consultation on your particular case.